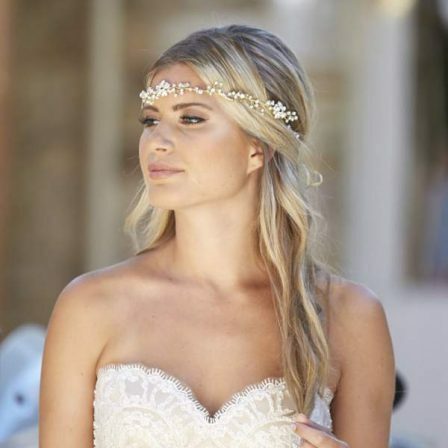 Wonderfully sparkly beaded veils with diamanté, pearls and crystals or even a full beaded edge trim. We know we have our brides out there who love a bit of sparkle — trust me, we’re right there with you! Beaded veils can give brides who’ve chosen an otherwise plain gown the opportunity to glam it up a little. 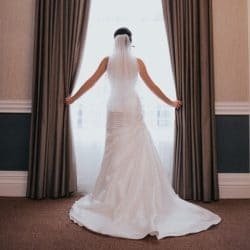 There’s nothing nicer than a simple satin gown paired with a beaded belt, some understated jewellery and a diamanté scattered veil to give you a gorgeous — and more importantly, cohesive — bridal look. Other brides may simply wish to tie in the veil to their already sparkly ensemble. All brides have their own comfort level when it comes to the amount of bling they enjoy. With our three standard beading layouts you can adjust that level from a light scatter to catch the light, to full “falling stars” for maximum sparkle! Nadia is a two layer chapel length bridal veil with a pencil edge and scattered diamantes for a touch of sparkle. Veil dimensions are 30”+96”x72″ Chapel length – medium width. This veil is centre gathered. Carina is a single layer chapel length bridal veil with a pencil edge and lots of sparkling diamantes in our “falling stars” layout. Veil dimensions are 96”x72″ Chapel length – medium width. 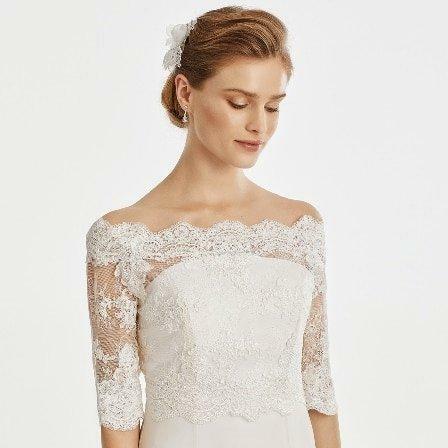 Rain is a two layer elbow length veil with a pencil scalloped edge and triple diamante beading. Veil dimensions are 20″+25″x72″ Elbow length – medium width. This veil is centre gathered. Serena is a two tier cathedral length bridal veil with a pencil edge finish and lots of gorgeous clear crystals in our “falling stars” layout. Veil dimensions are 30”+114”x72″ Cathedral length – medium width. This veil is centre gathered. Kayleigh is a two tier fingertip length wedding veil with a pencil edge finish and hand scattered diamantes. Veil dimensions are 30”+42”x72″ Fingertip length – medium width. This veil is centre gathered. Ursula is a one layer hip length veil with a pencil finish and gorgeous Ab crystals in our falling stars pattern.Ursula is a one layer hip length veil with a pencil finish and gorgeous Ab crystals in our falling stars pattern. Veil dimensions are 36″x54″ hip length – slim width. Katie is a single tier elbow length veil with scattered clear diamantes and a simple pencil edge finish. Features 3mm sparkling diamantes throughout in a light scatter. Veil dimensions are 25″x54″ = length – slim width. 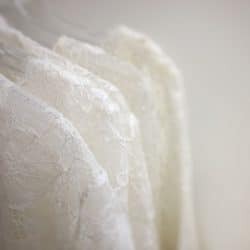 Frankie is a delicate two layer waist length veil with a simple pencil finish and scattered clear diamantes. Veil dimensions are 24″+30″x72″ Waist length – medium width. This veil is centre gathered. 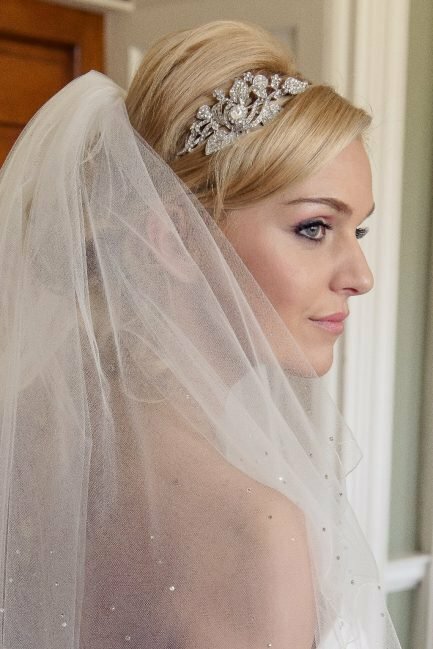 Natalia is a single layer chapel length bridal veil with a dazzling rhinestone edge finish. Carrie is a two layer hip length bridal veil with a pencil edge finish and a subtle scattering of diamantes. Veil dimensions are 30”+36″x72″ Hip length – medium width. This veil is centre gathered. Bryony is a single layer hip length bridal veil with a pencil edge finish and a scatter of clear crystals. The crystals are completely transparent and offer a touch of sparkle. Veil dimensions are 36″x72″ Hip length – medium width. 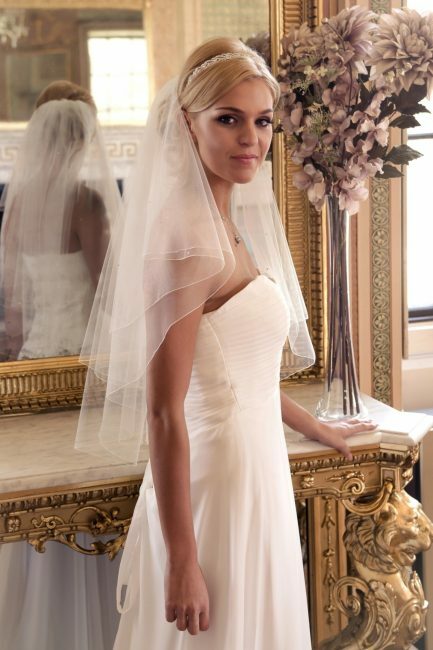 Yasmin is a two layer fingertip length veil with a pencil finish and crystals and pearls to the edges. Veil dimensions are 30″+42″x54″ fingertip length – slim width. This veil is fully gathered. Victoria is a two tier cathedral length bridal veil with a hand cut edge finish and scattered Ab (iridescent) crystals. Tiffany is a single tier cathedral length bridal veil with a hand cut finish and sparkling diamantes accenting the edges. Veil dimensions are 114”x72″ Cathedral length – medium width. Isla is a two layer floor length bridal veil with a hand cut edge finish and scattering of light ivory pearls. Veil dimensions are 30”+78”x72″ Floor length – medium width. This veil is centre gathered. Maria is a single tier floor length wedding veil with a hand cut edge finish and a light scattering of diamantes. Veil dimensions are 78”x72″ Floor length – medium width. Sydney is a two tier fingertip length wedding veil with a pencil edge finish and clear crystals in our “falling stars” layout. Abigail is a pretty two layer, elbow length veil with crystals and pearls. It features a simple pencil edge finish for a delicate outline. Veil dimensions are 20”+25″x72″ = Elbow length – standard width. Lydia is a single layer elbow length wedding veil with a pencil edge finish and an abundance of Ab (iridescent) diamantes “falling stars”. Features 3mm rainbow effect beads. Veil dimensions are 25″x72″ = Elbow length – standard width. 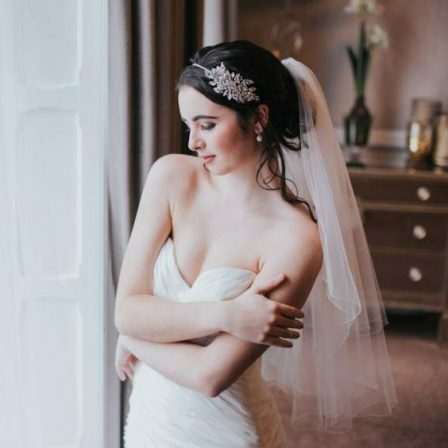 Jessie is a two tier shoulder length bridal veil with a simple pencil edge finish and scattered diamantes for a touch of sparkle. Features 3mm sparkly diamantes in a scattered layout. Veil dimensions are 18”+20″x54″ = Shoulder length – slim width.